Turn up at the masquerade ball look jaw droppingly beautiful when you disguise yourself in this superb womans Fever Baroque costume. Included is a gorgeous black and silver ball gown style dress decorated with an attached black jacket and lace fabric detailing to the bodice and bell draped sleeves. The lower half comprises of an attached skirt decorated with black peplums finished with lace ribbon accents either side. Make it a couples costume to remember this 31st October by pairing with our Baroque Mens Vampire outfit. 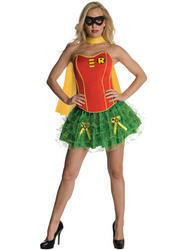 A stylishly sinister costume perfect for wearing to any Masquerade, Moulin Rouge or Halloween themed fancy dress party.